About 4 years ago Jim McCoy of La Fontaine, Indiana attended the area’s largest car and truck show in this part of Indiana. The Dave Kunkel Cruise in occurs annually and has grown to be the largest the state. Jim is a regular and always reserves the day to be a part of it. It was love at first sight when Jim McCoy saw this month’s featured truck among the many vehicles. This 1935 ½ ton is so rare! Their wood framework that supports all the body sheet metal has made almost all cabs a total loss during the past 80 years. Almost all trucks in those years were used for work only. Few were kept inside a building much less ever washed between rains! When water began to seep into the cab, rotten wood was soon to follow. 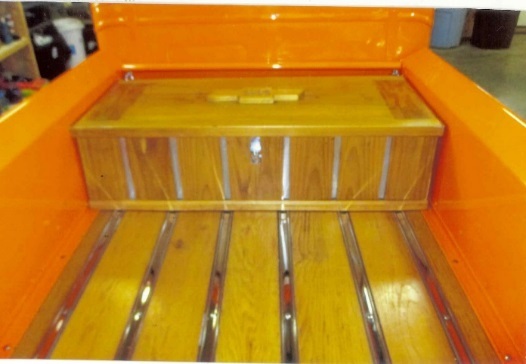 Replacing the wood frame in the cab would cost much more than just buying another working pickup! They then went to the salvage yard. 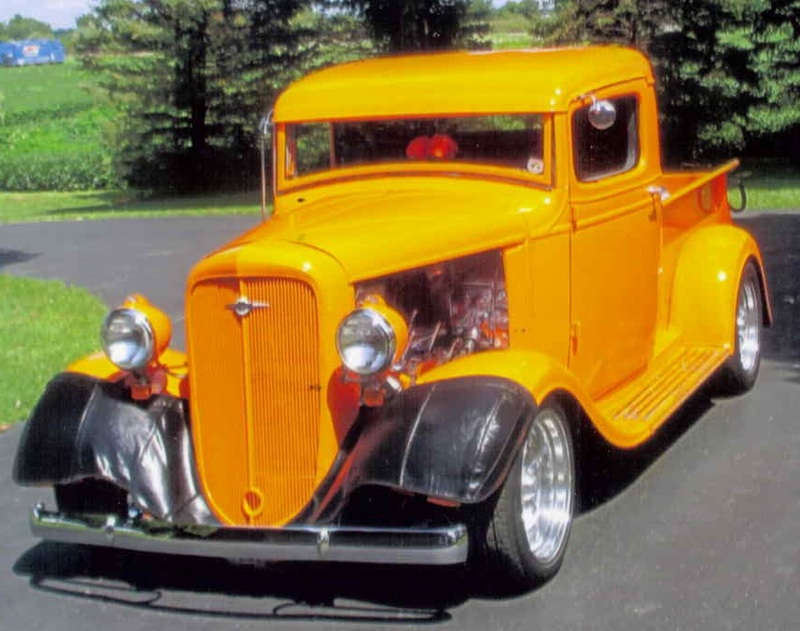 Jim quickly recognized this unusual truck as being an almost one of a kind in his area. He asked the owner if it was for sale. The answer was NO. A year later Jim was back at the show wondering if he would see this little orange 1935 again. Surprise, there it was among hundreds of other special interest vehicles. The owner was given the same question and the answer was the same. NO! The third year all was repeated, however to Jim’s surprise the answer was MAYBE. By the end of the show it was a YES! He was now the proud owner of one of the very few 1935’s remaining. Much cleaning, paint touch-up and mechanical tuning brought it up to updated quality. A very detail project was removing an accumulation of dirt and grease from all areas of the modern V-8 engine. Now, the chrome and orange paint shines like it was just added! The two hood sides have been removed to draw attention to the “work of art” engine compartment! As a final touch he attached blue lights to underside of the hood. A real eye catcher to draw attention to all the chrome during night shows and driving. The pickup has a 350 cubic inch V-8 engine, 350 transmission, front disc brakes, and a higher speed differential to keep up with highway traffic. 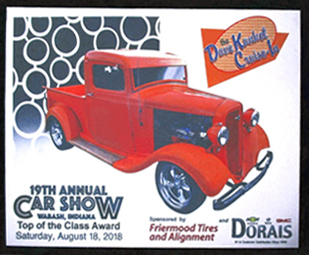 The organizers of this annual car show in Wabash, IN were so impressed with this 1935 that they used it on all show plaques given to entries in 2018. Jim worked for the Morton Building Company for 20 years as a sales representative, when his knees got bad at 61 years old the decision was made to replace both at the same time. He liked his job and wanted to go back as soon as possible. In 2008 he went in for knee surgery at 6:00am and later that evening he had a major stroke in the hospital! This put him in the intensive care for many weeks. Jim could not eat, talk and certainly not walk. We can only imagine the extra time and care the staff put in the first few days after his stroke to keep him alive. It has been 10 years now. During the first 5 years he had to teach himself how to talk. This was difficult for a person that made his living talking. Jim’s car hobby is his retirement therapy and aided in his recovery. 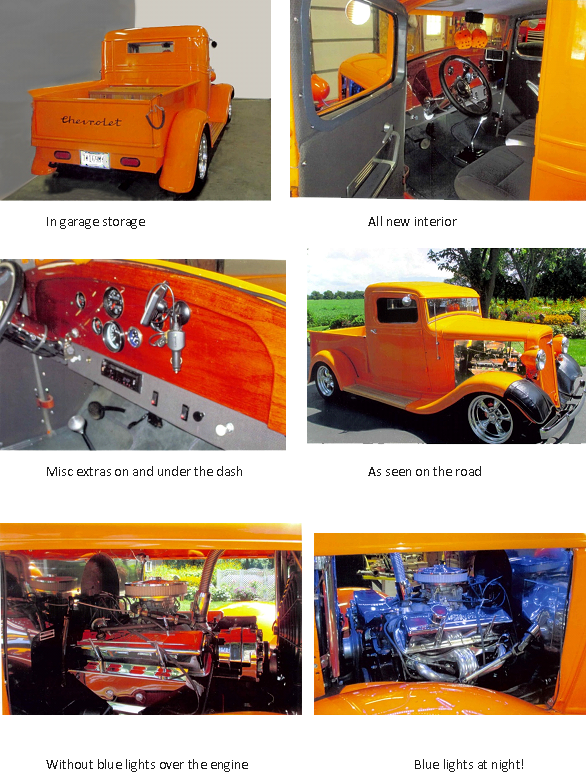 He drives a late model Corvette but loves the short drives with his special little 1935 ½ ton pumpkin. No speeding tickets yet! The 1935’s are so rare we feel lucky to have another from our 19 year Feature Truck series. Click on May 2014 to see and read about this other special 1935 ½ ton on our website. This entry was posted on Tuesday, February 5th, 2019 at 10:36 pm	and is filed under Featured Trucks [unsorted]. You can follow any responses to this entry through the RSS 2.0 feed. Both comments and pings are currently closed.